Global or International SEO (Search Engine Optimisation) is essentially, and ironically, not making your content and website appeal to a larger audience directly – but tailoring it for various smaller audiences. In marketing, this is often referred to as a localisation of your content and marketing efforts. If you want to tap into a French speaking market, chances are you’re going to have a better shot at it if you’re speaking French to that audience, especially when it comes to online marketing. Google and other search engines are adept at helping users find relevant, local information that is going to be of genuine value to them, speaking their language is one of the most important steps in that process. Cloudwords offer some great whitepapers and datasheets on the importance of these efforts if growing your business worldwide is a priority and some great tips on what to focus on. In their paper entitled ‘New Imperatives for MultiLingual websites, they emphasise the importance of strategy, acknowledging but that this work can be demanding. Translation companies can definitely remove some of the burden here and ensure your translations are always correct and up to date. They also lay out clearly some of the facts and figures for the potential for growth if you begin to tap into non English speaking markets. 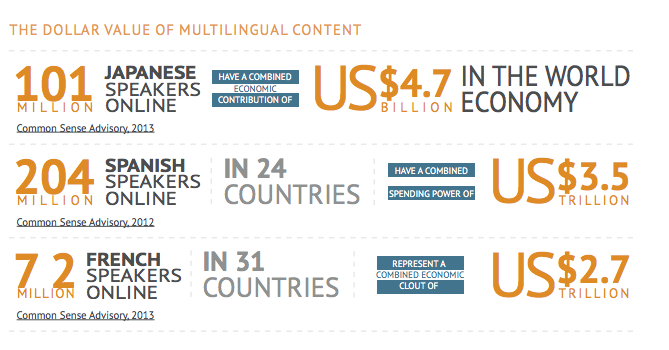 They state that the global market opportunity for online communications has reached 45.1 trillion US dollars, addressable via 116 online languages and that it takes at least 9 languages to have the chance to gain access 80% of this opportunity. You can find and download their resources here for more information. For quotes and queries on translation services for your business and localisation efforts, contact Dublin translation company, Instant Translation.